Directions: Use the following simulations to gather evidence to support your claim. Description: Explore bending of light between two media with different indices of refraction. See how changing from air to water to glass changes the bending angle. Play with prisms of different shapes and make rainbows. Description: In this lab you will be looking at the factors that affect if an electron is ejected from a metal by light. Also to see what factors affect the energy of electrons that are ejected by the light. Description: Make a whole rainbow by mixing red, green, and blue light. Change the wavelength of a monochromatic beam or filter white light. View the light as a solid beam, or see the individual photons. 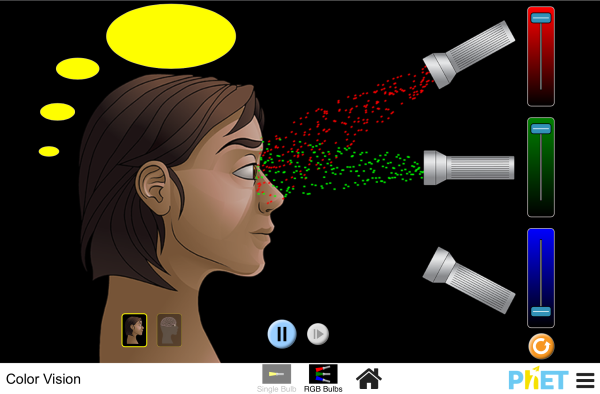 Description: Explore the interference of light as it moves through a double slit. See how varying the wavelength, angle and spacing between the slits affects the interference pattern and intensity profile. Description: Do you ever wonder how a greenhouse gas affects the climate, or why the ozone layer is important? Use the sim to explore how light interacts with molecules in our atmosphere. Description: This is a simulation intended to help visualize polarization. A polarizing filter has a particular transmission axis and only allows light waves aligned with that axis to pass through.